In a paint, the binder is the film-forming component of paint. It imparts adhesion and strongly influences properties such as gloss, durability, flexibility, and toughness. Binders include synthetic or natural resins such as alkyds, acrylics, vinyl-acrylics, vinyl acetate/ethylene (VAE), polyurethanes, polyesters, melamine resins, epoxy, or oils. Natural binders that can be used are chalk, lime, casein (non-fat milk curds), animal or vegetable glues, and oil. A substance is biodegradable if it can be broken down physically and/or chemically by microorganisms. For example, many biobased chemicals, food scraps, cotton, wool, and paper are bio-degradable; plastics, metals and stable chemicals generally are not. Durability is the ability to endure. Durable wood or wooden products are goods with a long usable life (both economically as well as physically). Durable products are much preferable from an environmental point of view, because they do not need replacing as soon and they can be reused many times. This is the phase in the life cycle of products, materials, tools, connections and finishes where they come to the end of their useful life and they are disposed of, recycled or reused. The term environmental footprint is used in the Wood Guide to describe all the impacts related to the production of a material of product besides embodied energy: pollution, waste generation, land use, illegal deforestation, water use, etc. In the Wood Guide we assessed low and high footprints using Eco-costs, a sustainability metric developed at TU Delft. The Wood Guide evaluates products and tools using a life cycle approach based on the technique of Life Cycle Assessment (LCA), using publicly available datasets like the Eco-cost database of TU Delft. Interpreting the results to help you make more informed decisions. Raw materials are unprocessed materials taken from the earth. They can be renewable (wood, natural fibres and all plant or animal-based materials) or non renewable (metals, oil, minerals and all mined materials). They are materials or substances used in the primary production or manufacturing of a good. The sustainability of a product is not only related to the raw materials of which it is made, but also to how both the materials and the product are transported around the world. Transporting a product by car from the shop to the house is easily the biggest environmental impact in the life cycle of a mass produced product. 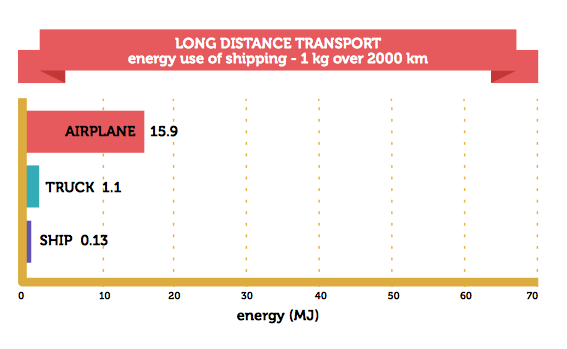 Because in long distance shipping thousands of products are moved at once, the environmental footprint is many times smaller than that of a single short range car trip. 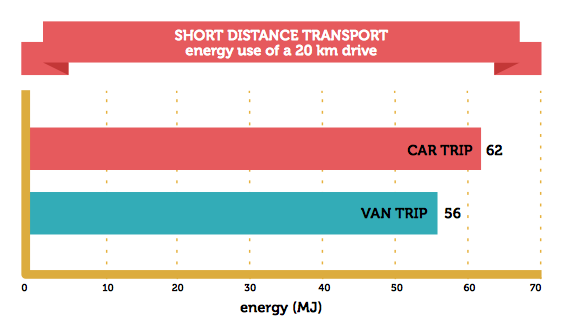 The graphs below compare the energy use of a 20 km drive in a car to shipping of 1 kg over 2000 km. The sustainability of a product is not only related to the raw materials of which it is made, but also to how it is used by the person who buys it and whether it offgasses chemicals. In the Wood Guide the sustainability issues connected to what happens after a wood product is put in someone’s home are described in the Use phase. Organic materials derived primarily from contemporary living organisms (fossil fuels are also derived from living organisms, but prehistoric ones). This definition can include natural materials such as leather and wood, although it typically refers to modern manufactured materials. These bio-based materials are engineered to provide a biodegradable alternative to plastics, such as cornstarch packaging pellets or bioplastics created with vegetable oil or starch. Disassembling is taking apart a product into single components. Disassemblable products are preferable from an environmental point of view because they offer the option of repairing or replacing components when needed. It also allows a more compact, space saving transport. The embodied energy of a product or material is the sum of all the energy required to manufacture it. Embodied energy is also called Cumulative Energy Demand (CED). Open access databases of embodied energies of materials are the Ecocost database of Delft Technical University, which was used in this Guide, or the ICE database of the University of Bath. Fillers reinforce the binder and give the paint texture and a thicker consistency. Most paint use mineral, inert materials as fillers, like chalk, talcum, marble and clay. Floor paints that must resist abrasion may contain fine quartz sand as a filler. Lead was used as a filler in paints for decades, before it was banned because of its adverse health effects on humans. Using wood labelled FSC is the first step for sustainable woodworking. FSC (Forest Stewardship Council) is an independent organization founded by NGOs such as WWF and Greenpeace that certifies wood that has been produced in a sustainable way. Wood without FSC label can come from regions where old growth forest is being clear cut illegaly, where indigenous populations are being removed from where they have been living for centuries and where rare species and natural ecosystems are being wiped out. This is especially true in the tropics, but also in European countries, Russia, North America and Australia. The release of a gas that was dissolved, trapped, frozen or absorbed in some material. Some wooden board materials, glues and paints take a few years to fully become inert. During this time, offgassing may affect indoor air quality. Any material or energy that can be replenished in full without loss or degradation in quality. Plant and animal based materials are renewable resources, just like sun, wind and hydro energy. Titanium Dioxide is the most common pigment used for white, but also as a base for other colours. The process of mining Titanium Dioxide has a high environmental impact: high embodied energy, polluting emissions and wastes during processing and depletion of scarce raw materials. The process of returning economic value to waste by redesigning it into green, socially conscious, desirable products. Volatile Organic Compounds (VOCs) are natural or synthetic toxins that evaporate at room temperature. Because of this they are released into the atmosphere, damage air quality and create health problems above certain concentrations. The “plastic” smell of new cars, fresh paint and glue are all caused by offgassing of VOCs. There are hundreds of types of VOCs and there are thousands of products that offgas VOCs in the first period of time after manufacturing. Concentrations of many VOCs are consistently higher indoors (up to ten times higher) than outdoors. Other examples of products containing VOCs include: paints and lacquers, solvents, paint strippers, cleaning supplies, pesticides, building materials and furnishings, office equipment such as copiers and printers, correction fluids and carbonless copy paper, graphics and craft materials including glues and adhesives, permanent markers, and photographic solutions.